Let customers pick their gifts for a birthday, a wedding or any other occasion, and share their selection with gift-buyers. Customers can prioritize gifts within the list or create multiple gift registries. 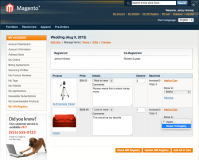 Why Use Gift Registry Magento Extension? Give your shoppers an easy way to ask for the presents they want. Let customers specify which gifts they want first, second, etc. Get notified about gift lists created and orders placed in your store. Gift registry is a simple way for customers to share their desires with friends and family. What does it mean to you as a merchant? This is a perfect opportunity to get to know your customers better and figure out their needs and expectations. These insights can lay a solid foundation for further decision-making regarding product assortment, pricing, extra services, and many other aspects. One-size-fits-all is out of the game now, as experience personalization has become the key to successful ecommerce business performance. Monitoring customer wish lists, online retailers get the ability to tailor their marketing campaigns to each buyer in particular. This way they can offer them the most relevant goods and services across all channels, as well as drive sales by notifying about the wish list items running low or price changes. As you customers send their wish lists to other people, the word-of-mouth marketing begins to work to your benefit. The more gift registries they share, the more new people get acquainted with your company. Not only it increases brand awareness, but also encourages new people to actually gift-shop at your store and even have something for themselves, boosting your revenue. Create a gift registry with the presents you want. Priorities your gifts, specifying which ones you want first. 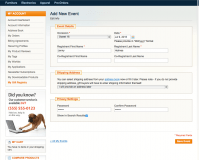 Indicate event date and your shipping address. Leave comments to desired gifts. Easily share your list(s) with potential givers. 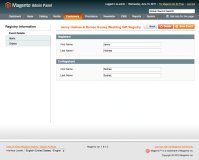 Create multiple Magento gift registries. See who purchased each gift & read the notes they left. 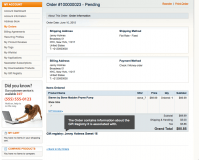 Track the status of each purchase and see when it’s Pending. Protect your gift list with a password. 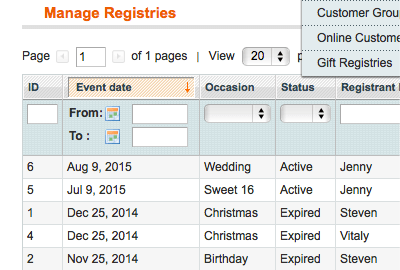 Search for publicly available gift registries. 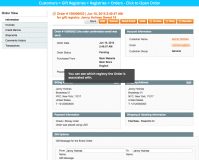 Add items from other customers’ registries to yours. 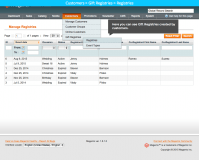 Define the scope for Magento registries when using the extension in more than one store. 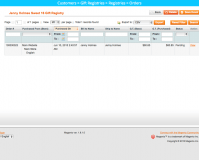 View a list of created registries. 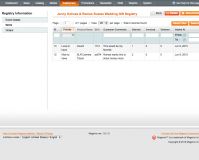 View Magento registry details: added items and completed orders. 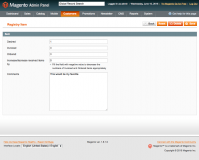 View related Magento Registry ID in Order Information. 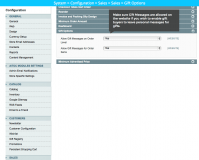 Get notified about new registries created and orders placed (optional). Prevent list owners from protecting registries with passwords. Prevent list owners from hiding registries from search. New! 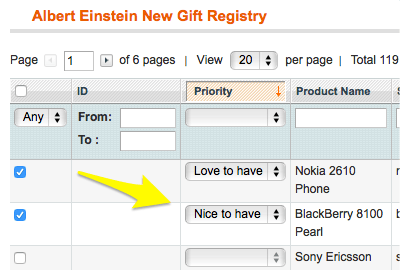 Create a gift registry from the admin view and add products to it. New! 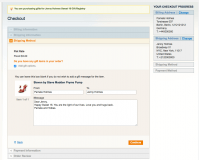 Identify a gift list owner in the admin panel by email. 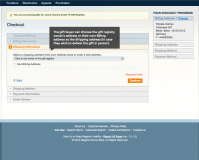 The extension supports Magento Gift Messages. 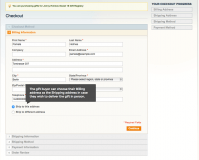 Magento Gift Wrap plugin - Set up an optional service, such as gift wrap, rush order, and charge extra for it! 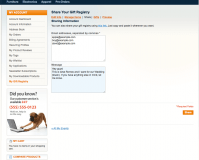 Magento Customers Also Bought extension - Take advantage of upselling and cross-selling at your store. Magento Price per Customer module - Target your customers with personalized offers and deals. .
* Fixed an issue with adding multiple configurable products to a registry in the admin panel. * The Gift Registry title tweaks. 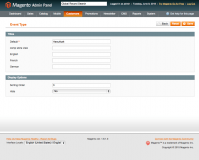 + The extension is compatible with Magento SUPEE-6285 patch. * Fixed an issue with "Configure" button in admin panel. * Fixed an issue with adding product to the cart after empty cart with gift list product. 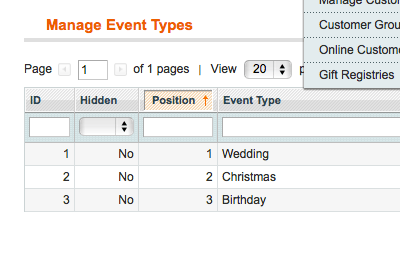 + Ability to identify a gift list owner in the admin panel by email. * The issue with the product not showing up on the gift list when added from a grouped product and the issue with parts of a grouped product not visible individuality have been fixed. 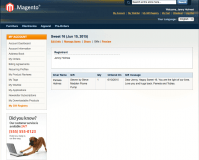 * The design issues are fixed for Magento CE 1.9+. + Gift list owner shipping address info is added to share registry email. * French Language Pack is updated. * An issue with co-registrant's name is not included in Share email is fixed. 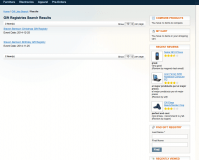 * Incorrect configurable product price issue is fixed. * Fixed the incorrect action when adding to cart after failed attempt to add to registry. * Issue with no registrant's shipping address at checkout if address is entered after registry creation is fixed. * Issue with incrementing product's quantity upon multiple addition to gift registry is fixed. 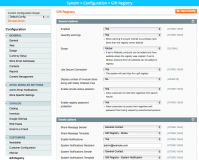 * Fix is added: a current class is applied to "My Gift Registry" now. + Compatible with Magento CE up to 1.8.0.0. * Fixed the issue when an event takes much time to be loaded for viewing. * Fixed the issue with displaying the date of event in the format not relevant to the one configured in the system settings. 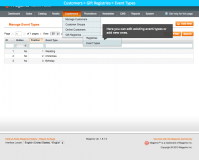 * The issue with displaying the different dates of the same event is fixed. + Allows admin to deny gift list owners to hide registries from being displayed in search results. * Not displaying the custom options of products in gift lists is fixed. * Some spelling mistakes are fixed. * Front-end performance improvements of the extension. * Fixed the incorrect displaying of price and currency symbols. * The issue with editing the number of the received items by an admin is fixed (Customers > Gift Registries > Registries > select registry, open Items tab > click on View link in Action column > "Increase/decrease received items by" option added). * An incorrect counting of the invoiced and ordered numbers of the products is fixed. * Registries and registry items are now displayed according to the selected scope of the store. 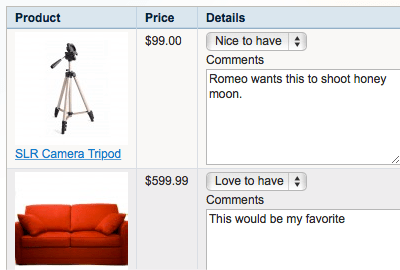 * Incorrect displaying of the thumbnails within the grouped or configurable products is fixed. * The ajax sorting issue fixed. * Fixed the lack of pager at the Popular Gifts page. 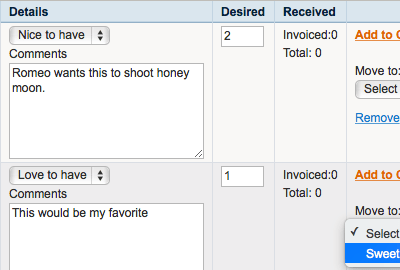 + Displays "SKU" and "Customer Comments" columns on the Items list of each registry in admin panel. + Compatible with Magento 1.4.0. 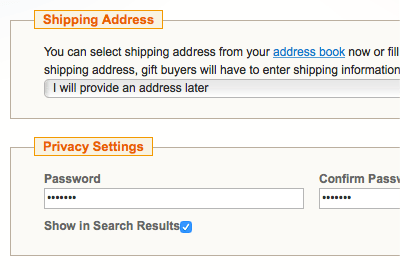 + Ability to select an amount of each gift and add the required ones to cart at once. 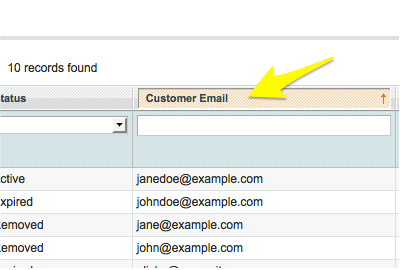 + Displaying the list of available registries to add a product to the required one from a catalog page. + Compatible with Magento 1.2.0. An extremely useful application for the store administrator, boosts sales, add customers loyalty. Thank you! I'm just a happy customer. Installed 4 different gift registry extensions but this one has a clean code, no core rewrites, no encrypted files and works out of the box. Thank you. The module helped me with clients who need to create the list. However, difficulties to install and manage some items not to be an advanced user, I found. However, I always had the willingness to support that helped me throughout this process. Furthermore, the manual is also very explanatory. I recommend this solution! Outstanding support. Fast, uncomplicated and successful. Thank you! The support was exelent, it only takes less than 18 hrs to get support. The extension is working well. I recommend the developers!! Great Support solve some minor issue and important thing is quick reply for support center. Nice Extension. Great solution for gift registry This modules provides great value for the price you have to pay for it. With not a lot options for Gift Registry in Magento on the extensions website, this extension is a more then adequate solution. 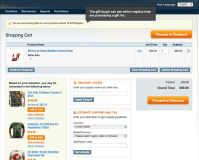 Customers can create their own Gift Registry and fill it with the products they desire. When someone buys a product from their list, the list is instantly altered so that the desired product is not on the list anymore or the desired amount is adjusted. The support that comes with this module is awesome. They respond very quick and provide fast and great solutions for the problems you might run into. I would definitely buy from this company again. It is a nice product. Support was very good and was able to work through the issues. AITOC team has been really helpful and promptly helped with all issues and questions. After an initial issue with installation which was quickly sorted out by the very helpful customer support, I have found this gift registry to be an excellent product. I have been very impressed with it since installation and my client is happy too. My client was interested in a gift registry as part of a new online store. AITOC was really the only solution with all the features they required. 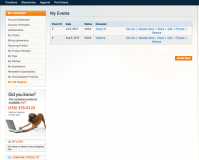 I installed it and was pleased with the seamless integration with magento and my client has been very satisfied with it. Also, I must add that AITOC customer service has always been helpful and quick with a reply to any issue that arise. We really could not have made a better decision. I have been using Aitoc modules for some time and been very satisfied with every order. Gift Registry is a nice way of enhancing your customers experience and the only module on the market that can handle registries properly. Moreover, Aitoc team has been really helpful and promptly helped with all issues and questions. 5 stars from me! I have been using Aitoc modules for some time and been very satisfied with every order. Gift Registry is a nice way of enhancing your customers experience and the only module on the market that can handle registries properly. Moreover, Aitoc team has been really helpful and promptly helped with all issues and questions. Well Now I have to apologise ... it was my fault as I made slight adjustment to my template. So now I am very happy and feel bad for saying a bad word Well done Guys LOve your work !!! Had some initial troubles getting it set up and configured, but support was very good and was able to work through the issues. Has made our customers very happy, and think it will really help us drive revenue growth.